Being baptized is not the key to salvation. Instead it is a bold expression that you’ve been saved! Baptism is a public profession of your faith. It conveys your relationship with God and His covenant with His people. Baptism is a symbolic display on the outside what is happening inside our hearts. Each person’s baptism is a proud moment in the life of the church and every baptism story is special to God and to our church. Does the water of Baptism have magical or supernatural power? No, water is water. It doesn’t wash away sin or give eternal life. Water can wash dirt from your body; it can’t wash sin from your inner being. But the water of baptism represents the blood of Christ, poured out when he was nailed to a cross, and Jesus’ blood does wash away sin and purchase eternal life. The person may be completely immersed in water or sprinkled with water. Since the water is only a symbol, the amount of water is not the important thing. Whether you are baptized through sprinkling or immersion, it fits with the Bible and highlights a beautiful reality. Baptism is God’s way of marking you as part of his church and as a member of his covenant. That involves great privilege. And with great privilege comes great responsibility. As Jesus put it, “From everyone who has been given much, much will be demanded” (Luke 12:48). Baptism isn’t just about what you can get from God. It’s also about God’s claim on you. It’s a privilege to be baptized in the name of the Father, to be part of God’s family, loved and protected by him. But with the privilege comes responsibility. If you are baptized in the name of the Father, you must obey as his child and treat the rest of the family as dear brothers and sisters. It’s a privilege to be baptized in the name of the Son, Jesus Christ, to be washed by his blood and share in the benefits of his death and resurrection. But with the privilege comes responsibility. If you are baptized in the name of the Son, you must honor your Savior and follow Jesus wherever he leads. It’s a privilege to be baptized in the name of the Holy Spirit, to have the living God make his home within you, giving you rebirth and renewal, uniting you to Christ, making you more and more like him, and filling you with fresh life and power. But with the privilege comes responsibility. If you are baptized in the name of the Holy Spirit, you must keep in step with the Spirit and not grieve him. For everyone who decides to follow Jesus, baptism is the next step. 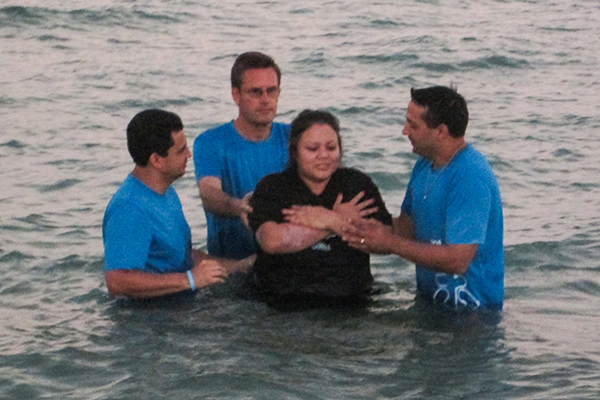 Anyone who commits his or her life to following Jesus is ready to be baptized. Don’t wait until everything is perfect in your life to be baptized. That will take a lifetime. Baptism is a beginning, not the end of the journey. After salvation, if you were not baptized as a child, then baptism is the next step! If you would like Baptism is your next step on your spiritual journey, then we want to help you. Sign up by filling in your information below and we will be sure to contact you.